I moved exactly a month ago now and it’s taken much longer to get settled. I definitely reduced the number of boxes that were unpacked and have a functionally arranged closet….along with a pile of cloths still on the floor to be sorted through. In realizing I still possibly another year of breastfeeding my honey bunny I’ve tried to organize clothes by keeping those that are practical and easily accessible for that and then there is the sentimental reasons keeps, then the this is one of a kind how can i get rid of it. Those last 2 categories are mostly what is on the floor because I am strongly aspiring minimalist. Moving really really really reinforced that. You/we like to think we have not that many things until it’s time to move. Even then you look around yourself and see the big furniture items and maybe think I don’t have that much stuff, but once the furniture and big pieces are out, the STUFF is really where it’s at. I was so upset with myself for how much stuff I had. I’ve got boxes at the door of things I already identified as having been unused or unnecessary at the other place. Thank goodness for the silver lining of babies outgrowing things at a pretty consistent pace. On the one hand yes you have to keep getting them things, but on the flip side you get to get rid of things at the same pace. Anywhoooo I finally got to a box that has my jewelry and I’ve also sorted through that. Quite a few ended up in the bucket of jewelry I will NOT be keeping. Some are just because I never really loved them, but many are just not practical for a grabby baby who’s teething at this point. Today’s #afrofoto is one I kept. 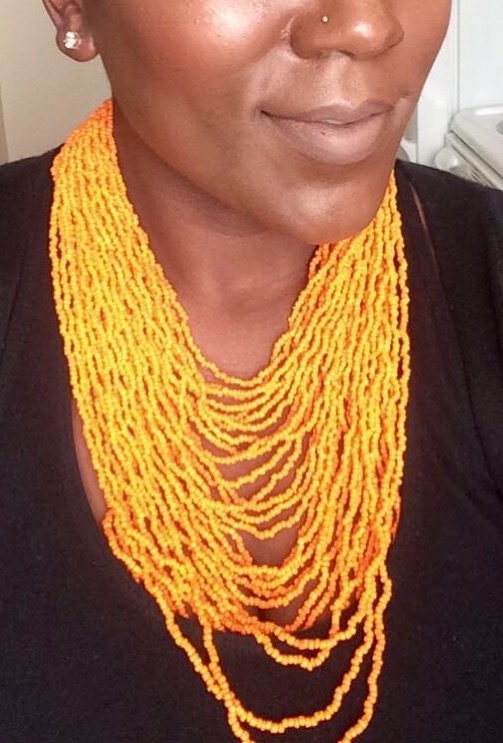 I have loved this necklace from the time I got it at one of the African themed jewelry stores at OR Tambo airport in Johannesburg. In fact, many stunning pieces I have are from shopping I did transiting through that airport. Pretty pennies were paid for them. I’ve definitely outgrown the jeweled phase of my style for now…or until my boo boo is well beyond being fascinated by colorful things around my neck. So yeah. What does the necklace have to do with moving and the stress of it? Nothing or something necessarily, but it was part of the STUFF we find ourselves with in these situations. Sooooo….confession time. I have another blog. At some point it completely pulled me away from this one here and I was completely absorbed into developing and growing it. It was about wine. Correction, it IS about wine and I enjoyed doing it so much and gained a teensy teensy bit of “fame” from it. It was during the time I lived in NE DC and would look for wine related events like tastings, launches, readings, pairings, etc. There was this ka-YUTE little wine shop that opened [I hope is still there] called DCanter (toooootal play on words) I enjoyed going to in Capitol Hill a comfortable walk or short bike ride to. Cute decor, not HUUUGE selection, but comfortable and they always had great events featuring sommeliers, vintners, viticulturists etc. The guy who owns it or is the manager was just genuinely engaging without being salesmany and it was just altogether lovely. Anywhoo back to my “fame” surely I can’t miss a chance to share with you guys. I walked in there looking specifically for a pinotage totally expecting to find just 1 bottle/type. Nope they had a few and he also put me onto something. We get to the front at check out and he asks me why I haven’t been writing recently. Guys! Like those are the small moments bloggers/I live for. Of course I died of shyness and was more interested in how he knew it was me….silly question i know, but you know…self doubt. Little ol’ me. Anywhooo back to wine. My favorite reds and possibly variety overall are pinotage (hyperlinked to one of the best resources for wine info and knowledge at whatever level (Wine Folly) and tempranillo. That first one is a variety unique to South Africa that wasn’t, until recently [nearly famous], that well known in the “traditional” wine world (French, Italian, Portuguese, Spanish – European). It was/is still sort of seen as an outsider, but from the moment I tasted it years ago I loved the depth of the flavor. Besides the typical bouquet of notes and flavors, it has an additional smokey essence (wouldn’t quite call it taste) to it. Like how things back home sometimes do. It’s a slow and unrushed sip. One where you take a sip and listen to what it does to your mouth and how it warms your chest like a cuddle. 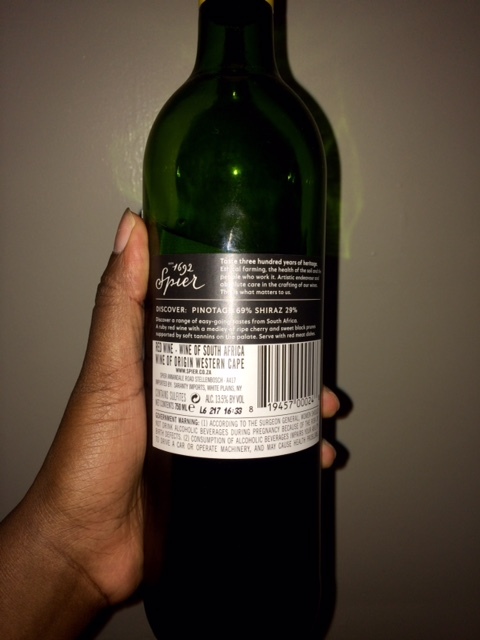 Ok that’s it this is not my wine blog, this is —-> https://thatoeno.wordpress.com (ThatOeno on twitter as well). 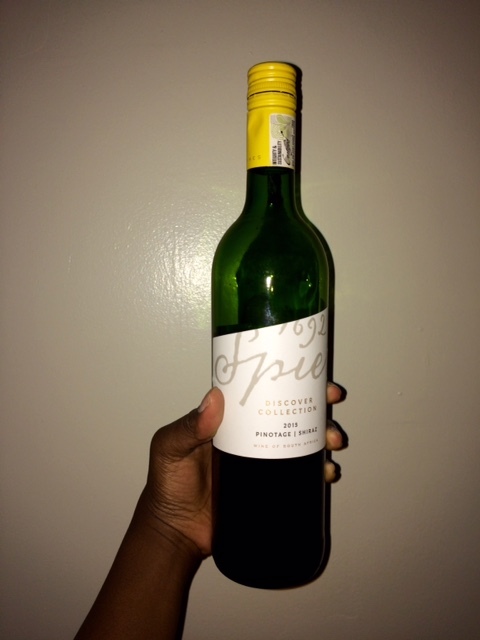 The pinotage is a 2015 shiraz blend at 15.5% alcohol (the higher the percentage alcohol of a wine the slower it’s suggesting you sip it …to me) and it tastes like all the wonderful poetry I started to tell you all above. 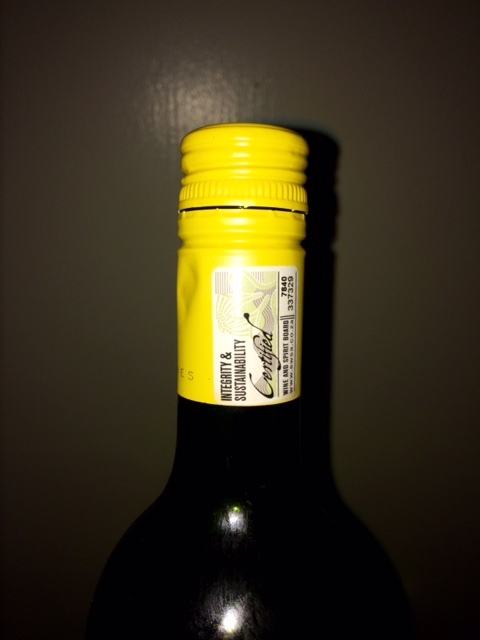 Besides “Wine of South Africa” one of the signature markings of wines is the screw top. Another reason why European wines/industry kind of hates on them. The South African industry has always been about sustainability and has been able to adapt with the times. Corks, although traditionalists mad at the democratization of wine consumption might beg to differ with a pinky in the air, especially natural ones, are terrible for the environment and sometimes the wine itself. More on environmental effects at this website – Academic Wino – another incredible place on the internet with my types of information superheroes. They also, as I’ve experienced too many times, sometimes crumble into the wine and are difficult to remove. It also makes it so you have to finish a bottle because it doesn’t keep that well once the cork isn’t airtight. 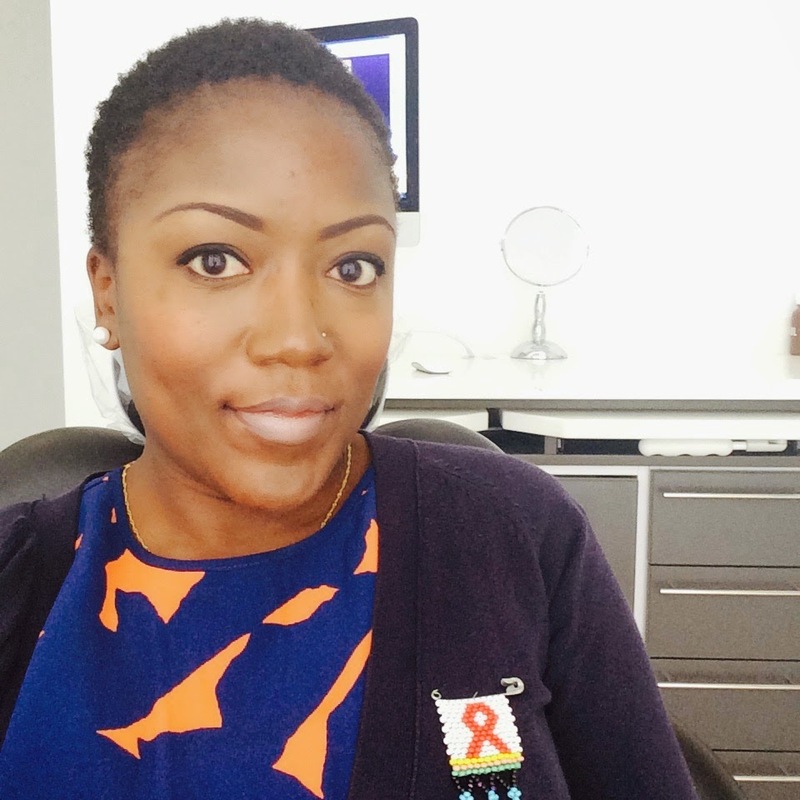 Today was World AIDS Day – December 1st. The first day of the last month of the year. The last hoorah! Also the peak of the holiday season and the coldest of winter’s days. Thanksgiving came and went and exorbitant amounts of food consumed therein have since been digested and excre.. I wore my Zulu Love Letter that my mom gave me many years ago and I’ve done a great job of not losing it as little as it is and for the many times I’ve moved. All Zulu love letters have a certain language or coding and identifying properties that communicate marital status, family background, clan etc to those in the know and between women in a community who produce them for men whether strangers or familiar suitors. Happy World AIDS Day! Beyond today, know your status and get tested. p.s. Enjoy this Kwaito December anthem, by the best that ever did it – TKZee. Timeless hit for the festive season and a summertime Christmas! The biggest artist of our times is Beyonce. Hands down. Hi five to the entire Bey-hive – all gazillion of you! It’s almost safe to say that she’s dominated the entire second decade of the 21st century. Why am I writing about her when I’m supposed to be focusing on Africa? you ask. Well, there are connections to be made and possible appropriation to be concluded because her originality can and needs to be challenged. The song continues on it’s jammingness, but the part where she really gets down on her Grown Woman-ness is when the drums are the heaviest and the song sounds the most African. Beyonce’s so original *insert dramatic eye roll*, but all these things are not for nothing. They are part of a continuum in her life and involvements between she and her husband. Who knows when it will end. Will she keep ripping dance moves, will Boko Haram release the Chibok girls to only her, …. To not risk coming off as a Beyonce hater I will say what her greatness comes from is the fact that she does not let her left hand know what her left hand is doing. To me, many people know Beyonce only from her albums, world tours, cute Lil’ Miss Lady Blue Ivy and somewhat mysteriousness – the right hand. They do not know much of what she does in, for and about Africa. I am fascinated by what I discovered her left hand is up to. 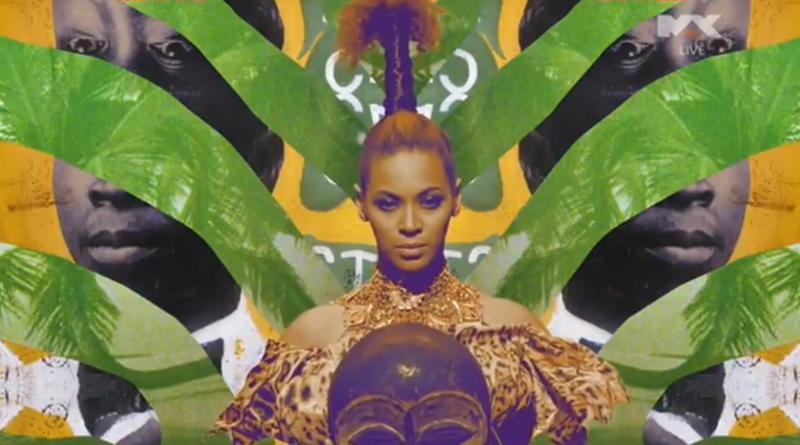 I’m ok with what OkayAfrica referred to as the “Africanization of Beyonce” as long as we don’t see Beyoncification of Africa. Like the song says, Africa is a Grown Woman and she can do whatever she wants. On the weekend of Easter some friends and I drove to Johannesburg just to have a change of scenery and roadtrip/hangout. We left early in the morning at about 2:30 in the morning and eventually arrived in Jo’burg later that day about 2:30 in the afternoon. Yes a whoooole 12 hour long drive. I’ll definitely tell you more about the drive in a separate post. While I was in Jo’burg I was torn as to when I would come back to Bulawayo because my friends I’d gone with were planning on coming back on [maybe] Wednesday. To be fair she was coming to see her boo so I fully anticipated the possibility of staying longer, but knew I couldn’t be away from home that long. A friend of mine was getting married in Bulawayo that Sunday, but I still wasn’t sure if I wanted to attend. That Saturday morning my grandmother called me telling me she wasn’t feeling well and asking when I would be back. That was all i needed to know I was leaving THAT very day. I logged online and bought my Intercape bus ticket for the bus leaving at 6pm. I was going to make it to the wedding after all. I got into Bulawayo on Sunday morning and showered and took a nap once I got home. Woke up and went to the wedding with my grandparents. It was a lovely garden style wedding. The girl was getting married to a Belgian guy and his brothers and boys had come all the way for the ceremony. There was very good entertainment and the food was decent. The dance floor opened up and then the announcement for the bouquet throwing came. I smoothly and sharply went to take my seat with a childhood friend’s parents as we caught up and chatted a bit. Music stops and single ladies are asked to get on the dancefloor for the catching. I sat there and rolled my eyes because I always haaaaate this [silly] part. My grandmother shouts from the other side of the room that “Pumpkiiiiiin!! Sukuuuuuuma [get up]! !” Oh snap, how do I say no or not stand up? So I did. All the dressed up ladies are all screaming at the bride to throw it at them, some are pacing so as to maximize the surface area and probability of catching the bouquet. Since I was not the most excited to be up there I stood still in the back. The bride approaches, turns around and chucks the bouquet. Before the flowers even left her hands all the other ladies were screeching and jumping/dancing. As if in slow motion, all I did was put one arm up and the flowers came straight to my hand. I didn’t even lift my calf or ankle or anything [the heel on my shoe was so high I might have fallen had I tried to anyway). Apparently I have a year according to the people who came to congratulate me. A year to do what I’m not really sure. It might be to have a wedding or it might be to meet someone….*shrug*. My mom, who wasn’t able to attend because she lives in South Africa and had travelled to Indonesia during the wedding, called the mother of the bride to confirm that I had in fact caught it lol….. I came home and put the flowers in a vase. They died about 4 days later.